For the latest site stats click [HERE]. 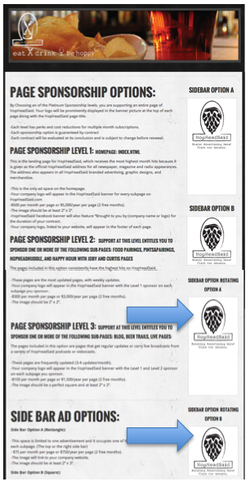 By choosing one of the Page Sponsorship levels, you are supporting an entire page(s) of HopHeadSaid. Your logo will be prominently displayed in the banner picture at the top of each page along with the HopHeadSaid page title. HopHeadsaid sponsorship: SUPPORT AT THIS LEVEL SPONSORS THE HOPHEADSAID WEBSITE AND Hopheadsaid PODCASTS. 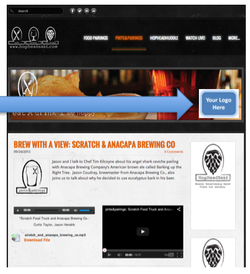 This is the landing page for www.HopHeadSaid.com (the official address given in any newspaper, magazine or radio appearance) and receives the highest monthly hits of any HopHeadSaid webpage. This address also appears in all HopHeadSaid branded advertising, graphic designs, and merchandise. -$500 per month per page or $5,000/year per page (2 free months). -This is the only ad space on the homepage. -HopHeadSaid Facebook banner will also feature “Brought to you by (company name or logo) for the duration of your contract. -Your company logo, linked to your website, will appear in the footer of every sub-page. 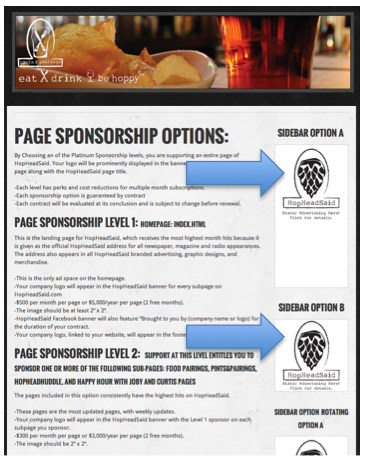 Sub-Page Sponsorship Level 1: Support at this level sponsors one of the following sub-pages: Food Pairings, pints&pairings, HopHeadHuddle, or Happy Hour with Joby and Curtis. -The pages included in this option, from which you can choose, consistently have the highest hits of any sub-page on HopHeadSaid. -$300 per month per page or $3,000/year per page (2 free months). -These pages receive weekly updates. -Your company logo will appear in the banner at the top of the sponsored subpage. 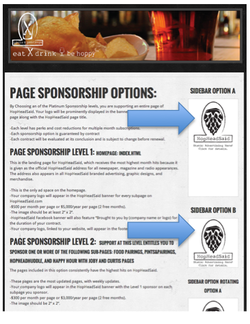 Sub-Page Sponsorship Level 2: Support at this level sponsors one of the following sub-pages: Blog, Beer Trails or Live Pages. -The pages included in this option are pages that get regular updates or carry live broadcasts from a variety of HopHeadSaid podcasts or videos. -$150 per month per page or $1,500/year per page (2 free months). -These pages are updated frequently, (at least 2 updates/month), but they also carry live content or are referenced in other social media platforms regularly. -This space is limited to one advertisement and it occupies one of the most visible ad spaces on each subpage. - $75 per month per page or $750/year per page (2 free months). -This ad space is located in the top position of the right side bar. -The image will link to your company website. -$50 per month per page or $500/year per page (2 free months). -Located directly below the Option B ad space. - $25 per month per page or $250/year per page (2 free months). -Up to three businesses can occupy this rotating ad space. -Located directly below the Option C ad space. 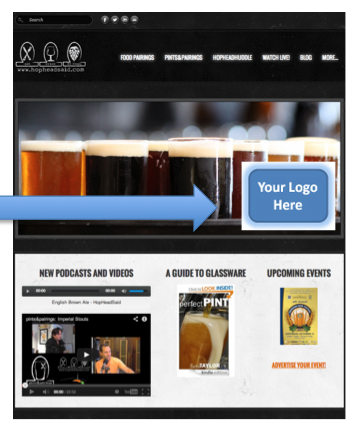 If you are looking for a different way to advertise your business, consider sponsoring a HopHeadSaid podcast or video. HopHeadSaid now produces two different podcasts, Happy Hour with Joby and Curtis and pints&pairings. These podcasts are typically live streamed in audio and video, as well. The podcasts are available on iTunes and the videos are available on YouTube. -Mention in the introduction of each podcast (ex. 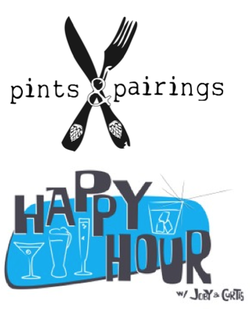 Pints and Pairings is brought to you by –your company name-. -After the opening, a short (approved by you) will be read before the start of each episode. -Company logo to appear in the edited video on YouTube and HopHeadSaid blog posts. -Sponsor 3-6 episodes get a 10% discount. -Sponsor 7-10 episodes get a 15% discount. -One mention/plug of business or product will be inserted organically into each episode. -Company logo will appear in the credits of the YouTube video. -Branded merchandise will be displayed prominently in the video. Contact HopHeadSaid for your advertising needs!